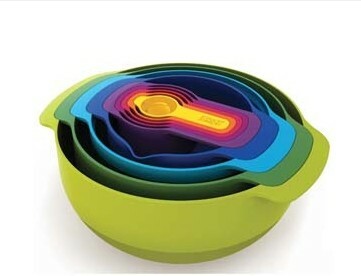 (25) This innovative Nest™ 9 Piece Set ($50.00) is a compact, space-saving food preparation set. This fun set includes nine essential culinary tools – five cup sizes (1/6, 1/4, 1/3, 1/2 and 1), a non-skid mixing bowl, sieve, colander, and over-sized mixing bowl – engineered to neatly stack inside of one another, and snap in place like puzzle pieces to prevent movement, loss, or damage. Dishwasher-safe.